I know long boots are coming back in this season but I still can't get over by obsession with ankle boots. No matter how many pairs I have, I can always convince myself that I need another pair and this season is no different. So it's good to know that this season has a few key differences in styles to help you justify at least one new pair. Another on trend difference this season is the patent/shiny finish and with the same colour dilemma, both colours in these Marks & Spencer beauties are sitting in my online basket too. They're slightly less pointy than the ASOS ones and a bit lower in the heel. I've tried these on - they are really lovely. 20% off with the current issue of Grazia, making them £55 with free home delivery!! I also loved these suede M&S elasticated panel boots that I tried on the same day - nice shaped toe, very wearable heel and also available in tan. The Acne Pistol is the classic ankle boot that most of us could only dream of. Mind you, if I added up what I've spent on ankle boots over the past 3 years, I'd have enough to buy a couple of pairs. Having said that, they do go into the sale now and again so worth keeping an eye out for them. This pair also from Moda in Pelle - the Loxley in black caught my eye. A bit high for the school run but check those Isabel Marant style buckles out! Clarks also have these lovely patent look boots - with a very wearable wedge heel, apparently what I'm *supposed* to be wearing this winter. Again, I have the love for both colours...will definitely try to get in-store to see what these look like in the flesh. Another trend I'm seeing across many brands is metallic and if comfort is of the essence, then you won't go wrong with these Amy boots from Esska. I've just received them in the post and can confirm that they look even better in real life and are unbelievably comfortable. Given my heel limitations this winter, these are going to be worn loads. I'll do a separate post on them to show how versatile metallic boots are. On the metallic thread but a bit higher, are these Lola Cruz boots from Daniel Footwear. The shape is very Acne-like also and the colour is fabulous. While I was on the Daniel website, I spotted these black Ash Spirals - another classic ankle boot - for just £99. Limited sizes available and sadly not in mine. Finally, I'm always asked every winter about navy ankle boots and the good news is that there are some lovely ones about. These Soho Ankle Boots from Boden with a black trim are a particular favourite of mine, though a little high for me at the moment. And somewhere in-between, it's the Boho Boot - very Ash Spiral'esque! And there you have it...if I indulged my boot obsession, I'd happily buy a pair of all of the above...just as well the budget doesn't allow! So a photo heavy round up of my favourites - hope it helps you if you're on an ankle boot hunt, as so many of you have told me in messages and comments. Happy Shopping! I can't get my head (or feet!) around the pointy toe look, too "cowboy boot" for me! I like the Marks ones though, about as pointy as I would like. Maybe it's because I really don't need to make my already big feet look even bigger!! Liking the metallic ones you bought and the Clarks patent ones. I am also an ankle boot addict and I'm looking for a Chelsea boot style, so I really liked the black ASOS boot, and the M&S offering. A really helpful post Avril, thank you. I like the Esska ones, haven't heard of them before, will have to check them out! Well, did you get the M&S Chelsea boots? I just got Grazia through the postbox and theres and M&S accessories brochure with a 20% off womens footwear and bags until Sept 23rd, think I may have to use it the next time I am in! 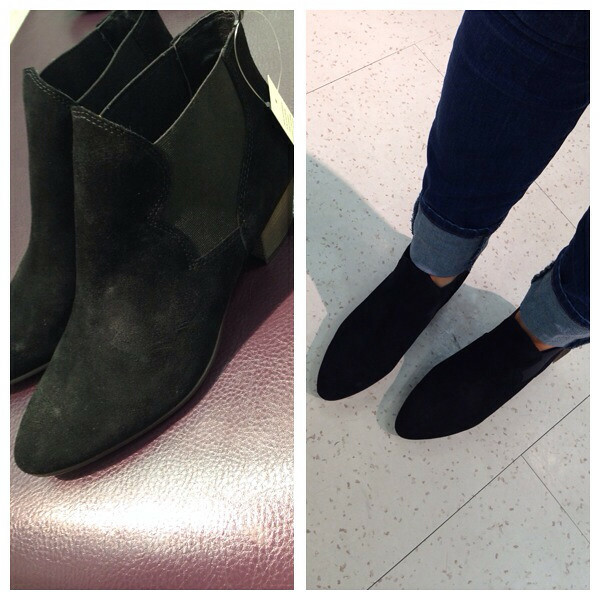 I was lusting after a pair of grey pointy suede Autograph ankle boots last week. think I bought about 6 pairs of ankle boots last winter, can never have too many, I still love my long boots though. I am nearly wishing the weather would get a bit more Autumn like and chilly so I can wear them! Oh I love it Carmel - 6 pairs!! 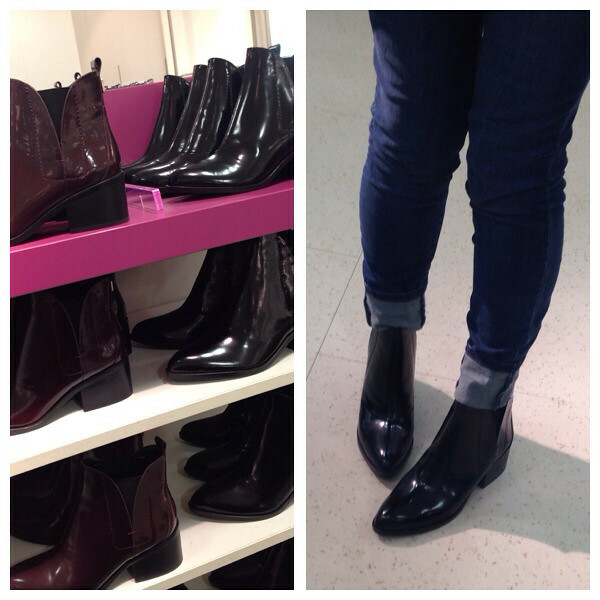 I must admit I am loving Boden's ankle boots this year and like them that they are Navy. Makes a nice change from black & tan. Great selection! Have you seen anything lovely in grey whilst scouring the shops? I'm after ankle boots with a medium heel to wear with predominantly navy slim legged cropped trousers or skirts for the office. Not sure if the Boden Boho in Pewter is quite the right colour. Grateful for any tips! Love your choices, and obviously had to buy a pair....the Chic ankle boots in navy from Boden have just arrived and are even nicer than the photo. Will look great with dark navy jeans and going to get lots of wear this autumn. Thanks Avril!